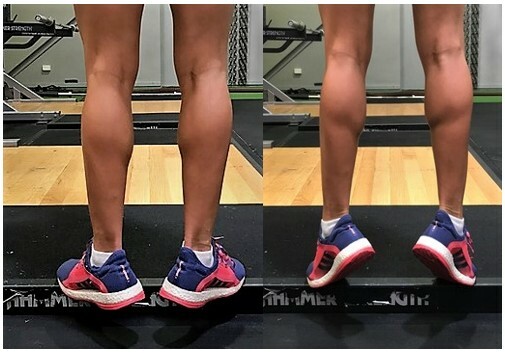 Start with your feet shoulder width apart on a small step with the balls of your feet firmly touching the step whilst your heels extend off of it. This will be your starting position. Raise your heels by standing on your toes holding this for 2 seconds as you slowly lower yourself down for 2 seconds. Advance to single leg calf raise. The different foot position will challenge different parts of the lower leg and feet. Start with your feet shoulder-width apart and point your toes inward ( Pigeon Style). Raise your heels by standing on your toes holding this position for 2 seconds as you slowly lower yourself back down to starting position. Advance to single leg. Start with your feet shoulder- width apart but now point your toes outward (External Rotation) lift your heels up off of the ground and hold this position for 2 seconds as you slowly lower yourself back down. Advance to single leg. Lie on the ground with your legs slightly bent and almost straight. Bring your heels in just an inch or two towards your glutes. Bridge up, driving through your heels and upper back and arms. Engage your glutes, hamstrings and abs whilst extending your hips. Hold this position for 20 seconds and slowly lower yourself down. Advance to single leg hold. NB- Be careful not to hyperextend your lower back in an attempt to make your bridge bigger. Starting Position- stand with your torso upright -Step forward with your one leg whilst the back leg is left stationary behind you. Now,stand up using your front leg and let the stationary leg be extended behind you. 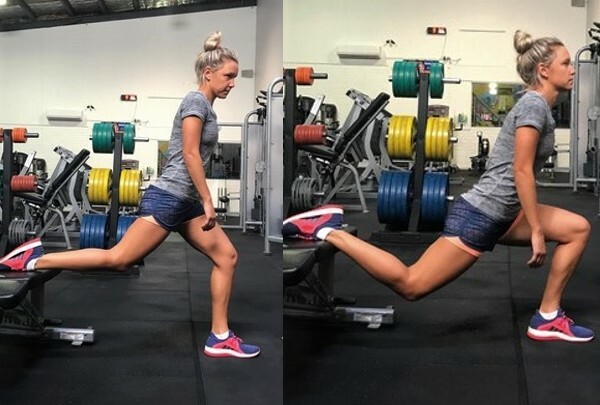 This movement will target glutes, hamstrings and quads. Hold this position for 3 seconds and go back to starting positon. Alternate between legs. NB- Keep your knee over your third toe-if you do not do this,this will put undue stress on the knee joint. Keep your front shin perpendicular to the ground. Lie flat on your back with your knees bent and feet resting on a chair/bench. 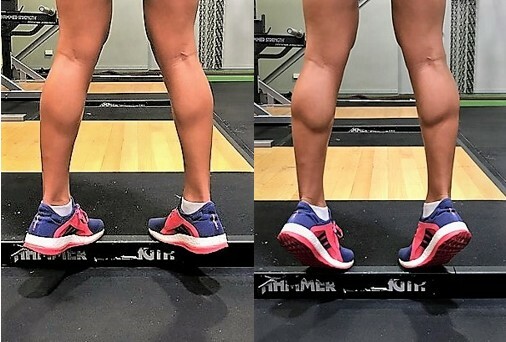 Feet should be shoulder-width apart. Holding this bridge, lift one foot up off of the chair, keeping the lifted leg straight. Pulse hips up and down in a controlled manner, do 12 REPS on each leg- Do not let your hips sag as you lift up your leg. Keep knee pointing to the ceiling. Lie flat on your back with your knees bent and feet flat on the ground. 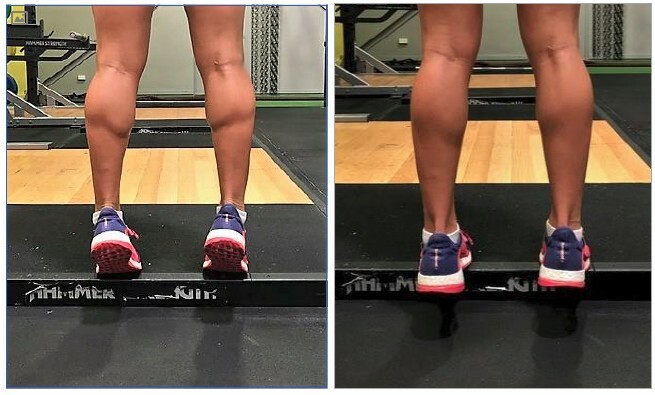 Feet should be shoulder-width apart. Holding this bridge, lift one foot up off of the ground, keeping the lifted leg straight. Move slowly to lift the leg then lower back down and switch. NB- The closer to your glutes your heels are, the more you will isolate the glutes. The further your heels are from your glutes, the more you will work your hamstrings. Stand in a wide- stance position. Feet should be pointed outward. Lower yourself down into the squat by pushing your glutes out as if you were going to sit onto a chair. Make sure that your knees do not flop in- keep them pointing outward. Hold this position for 2 seconds and return to starting position. Start with placing your hands shoulder-width apart on a bench or chair. Take a step back so that both of your legs are extended straight behind you. Bring your one leg towards your chest tightening your core muscles then extend your leg into a donkey kick. Keep knee bent and foot should be facing the sky. You will feel your gluteus maximus, rectus abdomininis and hamstring work in this exercise. Stand in front of a chair and reach one leg off of the ground- Keeping that leg straight. Now lower yourself down onto the chair whilst squatting with one leg. Make sure your knee is going over the third toe. As soon as you touch the chair, drive through your heels and stand up again. 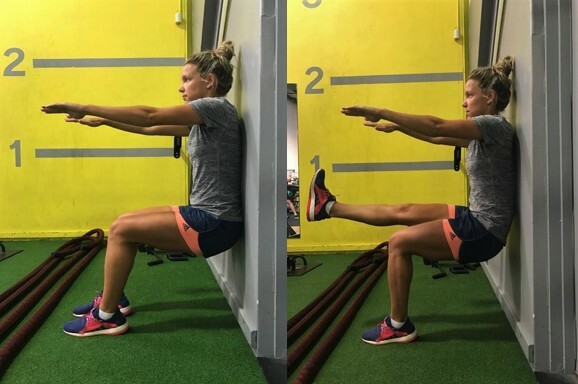 Advance this exercise to a pistol squat by keeping the leg off of the ground at 90 degrees as you lower your body down. Stand with your back facing a bench or chair. Reach one foot back and place the top of your foot on the bench. Lower your back knee down towards the ground by bending your front leg. 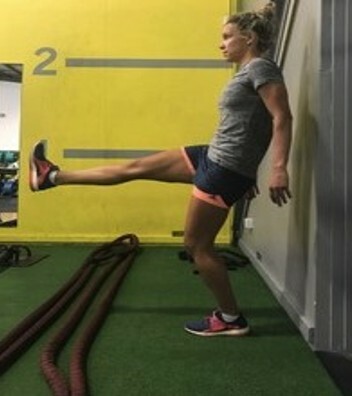 Make sure that your knee is going over your third toe – When the front leg is parallel to the ground, push through the grounded foot to return to the top of the exercise. Start with your feet shoulder- width apart, push your back against a wall and lower yourself down in a sitting squat. Knee should be going over third toe. Hold this position for 1 minute. Advance this exercise by lifting one leg up off of the ground- keeping that leg at 90 degrees. Hold for 20 seconds on each leg. Lean against a wall and lift one leg straight in front of you- imagine you were drawing circles with your foot. Move foot in small circles first going clockwise then anti-clockwise. Remain on all fours and tighten your abdominal muscles, keeping your spine and neck in a neutral position; slowly extend your right leg behind you while reaching your left arm forward. Hold this position for 2 seconds and return to starting position. Repeat using left leg and right arm. Rest your elbow on a bench at 90 degrees holding your body up in a straight line move into a side plank. Lower your hips up and down for 6 REPS and repeat on the other side. Lie flat on the ground with your arms and legs stretched out. Then, you lift one arm and one opposite leg at the same time. Lower your arm and leg back to the ground and then left the other arm and opposite leg up. Repeat 6 Reps on each side.